Ernie Barnes, the famous neo-mannerist artist, passed on April 27, 2009 at Cedar-Sinai Hospital at the age of 70. He died from complications from a rare blood disorder. Ernie Barnes was best known as the official artist for the 1984 Olympic Games in Los Angeles. He also was the “ghost” painter for J.J. on the hit TV sitcom “Good Times”. His painting “Sugar Shack” is probably his most famous and popular print due to it being showcased during the closing credits of “Good Times” and also because it was used on Marvin Gaye’s 1976 album “I Want You”. Ernie Barnes was one of the most succesful figurative artists of his time. His paintings featured ordinary people and athletes with elongated forms and closed eyes. They were typically painted in a manner that expressed their physical or spiritual struggles. His style has also been described as that of a neo-mannerist. He was born in Durham, NC on July 15, 1938 and was a professional football player prior to pursuing his true passion, Art. He has been commissioned by entertainers such as Kanye West, Flip Wilson, Sylvester Stallone, Harry Belafonte and many, many more. 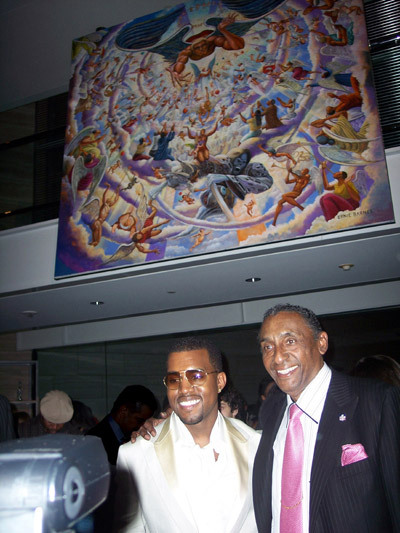 He was a tremendously talented artist and a true icon in the African American art industry. He will be missed. Rest In Peace Ernie Barnes!